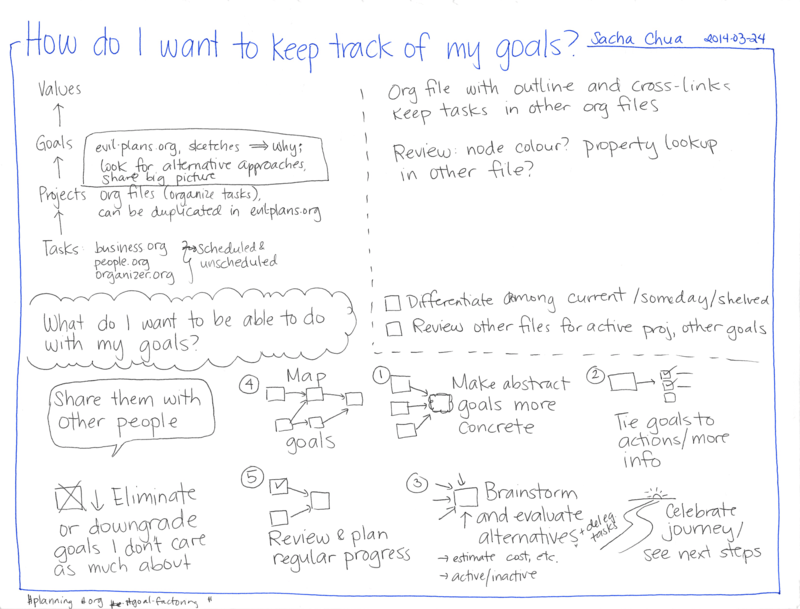 Following up on sketching my goals: I’ve been thinking a bit more about goal factoring. What do I want to be able to do with an overview of my projects and goals? I want to make regular progress towards important goals, especially since I tend to move from topic to topic. I want to translate abstract goals into measurable projects, and I want to translate those projects into actions. I want to brainstorm alternative approaches that may get me to my goals faster, cheaper, or more effectively. 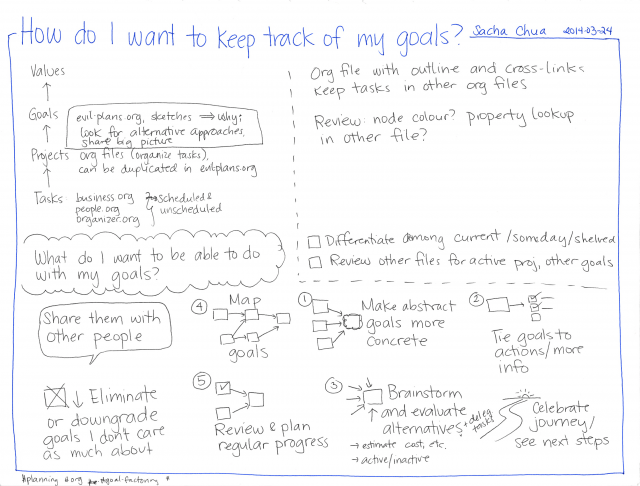 I want to see which actions or projects can support multiple goals. I want to prioritize my projects and goals, putting things on the backburner as needed. One of the benefits of writing down my goals is that I can look at the gap between plans and reality. 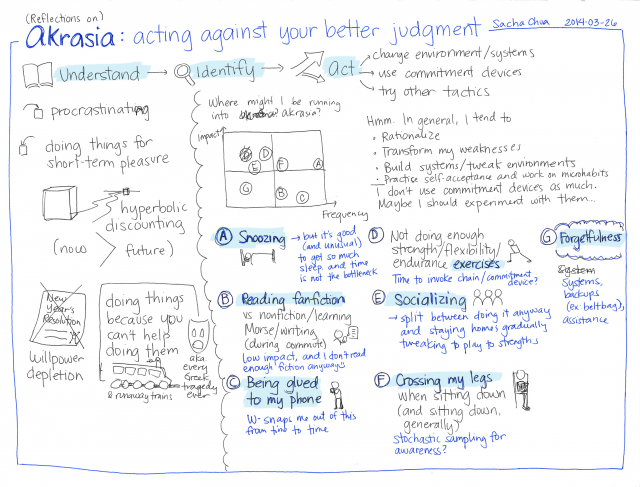 An e-mail conversation with Daniel Reeves (Beeminder and the awesomely geeky Messy Matters) pointed me to the concept of akrasia, which is when you act against your better judgment (Wikipedia: akrasia; LessWrong: akrasia). In general, this happens because we value the present much more than the future. Short-term gains are more compelling than future ones. Immediate pains matter more than far-off sacrifices. I haven’t thought a lot about akrasia yet. If I can understand the concept and identify my akratic actions, then I can change my systems or try other tactics to live better. Sleeping: I could probably get away with sleeping less. That said, it’s good (and uncommon) to get plenty of sleep, so this might not be too bad. I averaged about 8.9 hours a night over the past year. If I manage to tweak this to get, say, 0.5 hours more core time per day, that would be amazing. On the other hand, I could be the sort of person who really does need that much time, and it’s still within the normal range. We’ll see how sleep works out with my changing routines. Reading fanfiction during my commute when I could be reading nonfiction, learning Morse code, writing, or listening to podcasts… Actually, I’ve been doing more Morse code lately, so maybe this is not an issue. And I should probably have more mental downtime anyway. Being glued to my phone: On a related note, W- has teased me about my being occasionally glued to my phone. (It’s funny when I’m trying to tidy up or make the bed one-handed.) This is more of an awareness issue. Not doing enough strength/flexibility/endurance: Biking helps me with lower-body strength, but my arms are weak. If I don’t exercise to maintain my flexibility, I’ll lose it over time. I have plenty of energy throughout the day, although I suppose it’s good to build that up so that I have even more energy for bigger tasks. If I determine that mornings are the best time to exercise, then my lack of exercise is a combination of my desire to spend that time reading or writing (even though I already do this to the point of possible diminishing returns) and my dislike of how it initially feels to exercise. Socializing: I often don’t feel like going out, although I conceptually know that connecting with people is a good thing. I suspect it’s because I feel more connected with people around ideas instead of history or circumstance, and connecting to people over the Internet tends to more reliably result in good conversations like that compared to going to events or get-togethers in person. Crossing my legs: This is an awareness thing. I just have to notice it, and then I can gradually untrain myself. If I’m seated correctly, I’m fine. I tend to cross when I need a higher, slanted surface to draw on. More observations – maybe stochastic? There are lots of other possibly akratic actions in my life. These came to mind first when I thought about things that I often do and that I can change when I pay attention to them. Still, looking at this set… I don’t have a strong desire to eliminate akrasia while the suboptimal results aren’t major hindrances. I’m fine with having a little slack in my life. Even when my actions diverge from my stated goals, I still learn a lot. That’s an interesting meta-thing to explore, though. Am I too comfortable? I’ve experimenting with moving away from carrot-and-stick approaches to personal productivity (or taskmaster and slave) and more towards appreciative inquiry (let’s observe what’s working well, and do more of that). Most people want to become more machine-like in their productivity, reliably following their plans. The contrarian in me is curious about alternatives. I don’t know that life would be better if I worked with more focus or commitment. I know that it would be different, and there’s a possibility that following the butterflies of my curiosity also creates value. So let’s say that akrasia (or at least how I understand it so far) tends to be effectively addressed with self-imposed deadlines, commitment devices, constrained environments, and so on. Writers sign up for NaNoWriMo. Entrepreneurs bet each other that they’ll complete their tasks. Dieters remove junk food from their cupboards. These constraints support progress (by adding enough incentive to get people started or to convert downtime into productive time) or prevent backsliding (by removing temptations and distractions). What are the trade-offs I make for not using these tools against akrasia? Are there ways I can turn weaknesses into strengths for those approaches? Commitment devices are good for keeping you focused. If I let myself follow my interests, then I don’t get to take advantage of momentum or compounding results. However, my habit of sharing along the way means that people can get value even from intermediate steps. Cross-pollination is valuable, too. On my personal blog, it’s probably a good idea to have variety instead of focus, so that people can find what they’re interested in. Commitment devices are good for preventing backsliding. When you make undesired actions more costly (ex: eating junk food), you make desired actions cheaper in comparison (ex: nibbling on carrots). If I don’t tinker with incentives that way, then I’ll be more influenced by short-term effects rather than long-term effects. I am generally future-oriented anyway (ex: retirement savings, batch cooking) and I have fun connecting actions with long-term plans, so the disadvantages may be somewhat mitigated. I don’t have a sense of urgency around this, either. Perhaps I need to exaggerate long-term costs in order to make this more compelling. Have you reflected on akrasia? Can you share your insights?